Recently Microsoft has launched it’s new version of office 2010 and it now available you to purchase. If you don’t want to purchase office 2010 and you’re planning to use office 2010 software then this post may helps in getting or chance to win free copies of Office 2010 Genuine License key or I can say office 2010 product key. And this huge giveaway of office 2010 is carried out by the Official Microsoft itself. 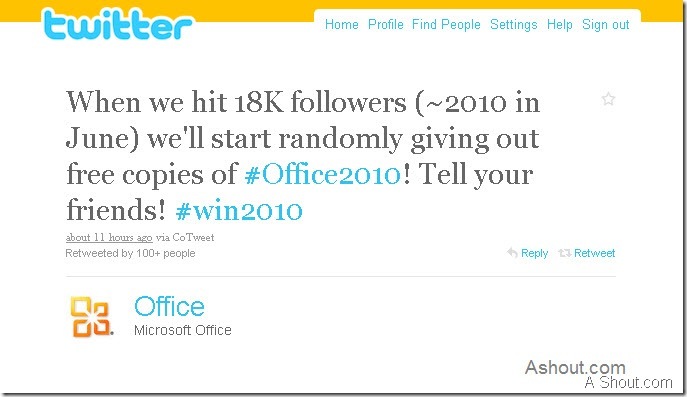 Yes, Microsoft is running a huge giveaway of office 2010 product in twitter and not in any of their official blog. They haven’t announced the number of Microsoft Office 2010 License they are providing. I think, they may provide 100+ copies of office 2010 product key (Genuine). That’s it! It’s so simple, you need to follow them to win Office 2010 product. Hope you enjoy this post. what you think about office 2010 software? Are you going to participate this giveaway? This offer only for US user. So, I don’t need to follow it. Nice sharing buddy. They haven’t send it’s only for US user, how do you know that it’s only for US users? Yehh bro , its only limited to US residents, @office is replying to tweets and asking whether they stay in USA . If it’s only for US residents, then it’s really not fair agreed. do you have a new one please ?? I Want genuine key for microsoft office 2010.. plizzz help me!!! can someone be kind and give me microsoft office 2010 product key. i need a genuine product id of office 2010 proffesional 32 – bit. It is interesting but, is it tru? Will i get one ? ?